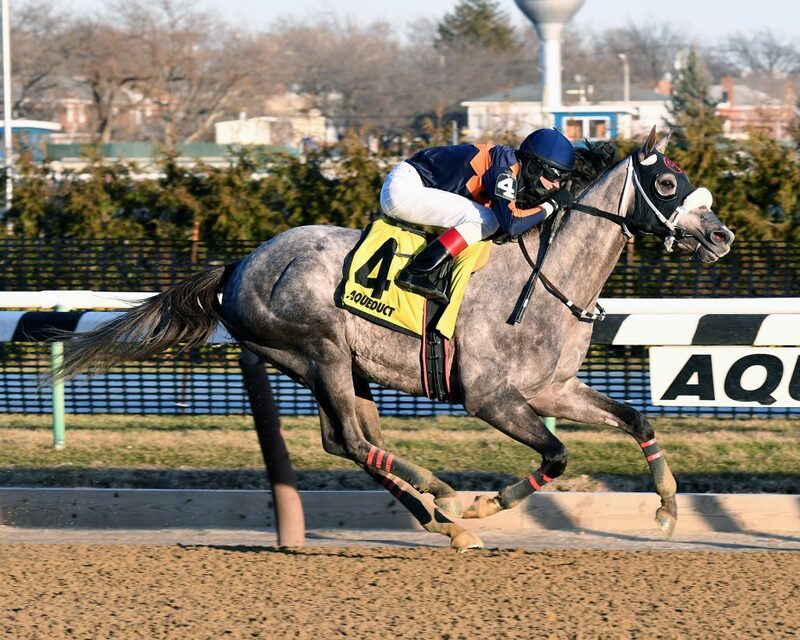 El Areeb winning the Withers Stakes (photo by Annette Jasko, NYRA). MMG Stable’s El Areeb proved himself anything but a one-race wonder Saturday with an impressive 4 ¼-length romp in the $250,000 Withers Stakes (GIII) at Aqueduct. Under regular jockey Trevor McCarthy, the Cathal Lynch trainee stalked an early pace while racing near the middle of the track, launched a bold move while still wide at the top of the stretch and ran down his frontrunning rival in deep stretch to draw away to victory. It was El Areeb’s fourth consecutive win and third in black-type company. Near 30-1 outsider True Timber set all the pace in splits of :24.29, :49.31 and 1:14.06, but was no match for the winner, who logged a mile in 1:38.30 before stopping the clock in 1:44.47 for 1 1/16 miles over a fast main track at The Big A. Following True Timber under the wire was J Boys Echo, Bonus Points, Apartfromthecrowd, Square Shooter, Fillet of Sole, Small Bear, Always a Suspect and Jaime’s Angel. El Areeb was the post-time favorite at odds of just less than 3-5 and was good for $3.10, $2.50 and $2.10. True Timber capped off the $37 exacta and returned $13.60 and $8. J Boys Echo paid $3.80 to show. The trifecta was good for $163.50. “I stalked and let him get relaxed,” McCarthy said. “I kind of stayed out of his way today. I got him to relax, settle and sit three-wide, and then I pushed the button on him and he accelerated. 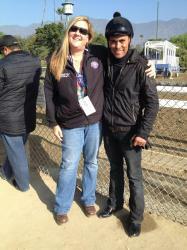 El Areeb, a son of Exchange Rate and the A.P. Indy mare Featherd Diamond, was bred in Kentucky by Dixiana Farm and was a $340,000 OBS March 2-year-old in training last year. He earned $150,000 with his latest graded win to bring his bankroll to $334,200. His career line reads 6-4-1-0 with all of his wins coming consecutively and including the Jerome Stakes (GIII) last out and the James F. Lewis stakes at his home base of Laurel Park. Lynch indicated that he didn’t know where El Areeb would race next and that all options, though the choice will likely be New York, are open. “To be fair to the horse, he’s done everything asked of him and then some,” Lynch said. “If he keeps doing this, I’ll talk to the owners, and we’ll sit down and talk about where we’ll go next, probably the Wood (Memorial, April 8). I don’t know if we’d go to the Gotham (March 4) or not, I’m not sure yet, but that’ll be the discussion we’ll have. We’ll see how he comes back the next few days and make a decision.